The Hats are ball cap style with the Isla Del Sol emblem displayed on front. They are available in 4 colors - Pink, Blue, Green and White / Tan. They are $15.00 each. 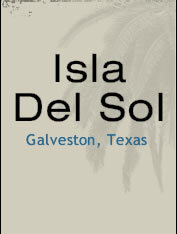 The Flags are blue (same color as our water tower) with Isla Del Sol emblem. Based on the number of flags ordered will determine the final price. Please continue on to post in order to access order form. Look forward to receiving your orders. Let's show our neighborhood pride. ?d. Once we get all the orders in on flags we can let you know the price per flag. Fireworks are not allowed in Isla Del Sol. Fireworks are not allwed in Galveston city or county. On Thursday, January 11, 2015, the Galveston City Council passed a Short-Term Rental registration ordinance which goes into effect on March 1, 2015. GARM was involved in the discussions as the ordinance was developed, and many of the rules in this ordinance are ones long practiced by GARM companies. See the attached copy of the ordinance. Fines for violation of the ordinance. The goal of this ordinance was for the City to know which homes are short-term rentals, to have owner and property manager contact information on file and to make sure that owners renting their homes are paying Hotel Tax. The City plans an “education” campaign to ensure that all West End and in-town homeowners who are doing short-term rentals know about the new ordinance. In the meantime, if you have any questions, feel free to call me at 409-797-5500.